This elegant apartment completely refurbished in 2013, designed to comfortably accommodate up to six people, is situated on the of a prestigious building with a doorman. You enter straight into the apartments main room, a spacious living room featuring a double sofa-bed, a glass table and chairs, and an LCD television. There are two bedrooms, the first is very spacious and is equipped with a double bed and an en suite bathroom with a shower. The second is slightly smaller and features two single beds. The second bathroom contains a bath and a shower. For groups of up to 10 people, the owner has another apartment adjacent to this one, so dont hesitate to contact us for more information. The apartment is located in one of the capital's oldest and most beautiful areas, full of boutiques, typical shops, wine bars and typical Roman restaurants, just steps from the luxurious Via del Corso and Via Condotti. The excellent location will allow you to comfortably reach almost all of the citys places of interest on foot. In just a few minutes you can be in the famous Piazza di Spagna, the Trevi Fountain and many other sites. From 1 pm to 9:30 pm. After midnight: no check-in accepted. Cot: free of charge and upon request. Voor ons is het verblijf in dit appartement uitstekend meegevallen. Wij waren maar met z'n drieën en hadden dus plaats genoeg. R. was zeer vriendelijk en behulpzaam maar z'n engels was niet optimaal. De keuken was van potten en pannen niet voldoende uitgerust om een volledige maaltijd te bereiden. ...1 Grote kookpot en 2 pannen. Maar we hebben ons beholpen. De douche in de badkamer ging niet echt goed en dus hebben we ons steeds gedoucht in het bad van de andere badkamer. De ligging van het appartement is echt TOP en het pleintje is eerder rustig.Op het 4 de verdiep heb je nauwlijks lawaai van de auto's.Het is gelegen onder het dak. We kunnen niet zeggen of de airco goed werkte daar we begin april geen last hadden van enige hitte. Ik zou dit appartement zeker nog eens boeken. The apartment is average size but cluttered with too much furniture, but only one small sofa to sit on! No sheets for sofa bed or extra pillows or pillowcases. Dear client, many thanks for your comments. The owner confirms to us his complete availability for clients during the stay to attend to any needs that the clients may have and to solve any potential problems as soon as possible. Viajamos en familia, 4 adultos y un niño y el apartamento nos resultó muy cómodo y acogedor. La situación es impecable (céntrico y tranquilo). La única crítica es relativa al equipamiento de la cocina: la vajilla un poco justa y echamos de menos una cafetera grande. R, nuestra persona de ...contacto ha sido excepcional en todos los aspectos y la atención por parte suya ha sido inmejorable. L'accueil a été parfait ! La personne qui nous a reçu a pris tout le temps nécessaire à notre arrivée (malgré notre gros retard ) et à notre départ afin de nous donner toutes les infos. Le logement est idéalement situé,très agréable et nickel .Jolie déco et assez de linge de toilette pour le séjour. 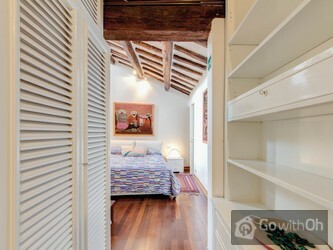 Ideal location just off Corso. Die Lage der Wohnung könnte kaum besser sein, alle sehenswerten Orte sind gut fußläufig zu erreichen. Die beste Eisdiele Roms ist gleich um die Ecke! Die Wohnung selbst ist sehr schön, gut eingerichtet. Die Klimaanlage ging in einem Zimmer vorübergehend nicht, dann ist es schwer auszuhalten- ...wurde aber auch schnell in Ordnung gebracht. Die Ausstattung mit Geschirr ist etwas dürftig. RECOMENDABLE 100%!!!! !, MUY BUENA UBICACIÓN, MUY BUENA RELACIÓN PRECIO - CALICAD Y LA ATENCIÓN DEL ADMINISTRADOR R. ES LO MEJOR!!!!!!!!! ES UNA PERSONA MUY DISPUESTA Y SE PREOCUPA POR QUE TODO ESTE BIEN. SEGURO VOLVERÉ! We waren in de wolken over ons verblijf in Rome. Onze afspraak met Rafaelle verliep volgens afspraak .Hij gaf ons volledige informatie en stond steeds ter beschikking. De high lights waren te voet bereikbaar gezien de centrale ligging, maar ook de bushalte was vlakbij. Het appartement was ruim en... functioneel en zeer rustig gelegen aan het parlement. Ons volgend verblijf in Rome mag het zelfde adres zijn. Für uns (Familie mit zwei Kinder im Teenager-Alter) war alles perfekt. Lage war hervorragend. R. war ebenfalls ein hervorragender Gastgeber und hat vor Ort alles bestens geklappt (Kontaktaufnahme per E-Mail/ SMS empfehlenswert). Nachdem wir im Appartement nur Frühstück zu uns genommen haben, ...war auch die Küchenausstattung absolut ausreichend´. Wer ein stilvolles, aus unserer Sicht absolut zweckmäßiges Appartement in bester Zentral-Lage Roms zu einem fairen Preis sucht ist hier bestens aufgehoben. Danke und gerne wieder. Apartment is in a brilliant location. We travelled as a family of 5 (3children-11,10,2) and the apartment had ample space for everyone. The owners were very accommodating, especially as our flight was delayed and we arrived quite late. G. son of the owner R. met us and showed us around the ...apartment and remained our main contact for our stay, was enthusiastic and committed to ensuring we were comfortable. All amenities were in good working order and clean. Highly recommend this apartment and we would most definitely stay there again. The apartment is perfectly situated only 5 minute walk to the Panthenon and 15 to Piazza Navona, both the Trevi fountain and Spanish steps are also close. We found R to be very helpfull and his english was totally understandable. There are lost of places to eat within a short stroll of the ...apartment catering for all tastes and budgets. i would have no hestitaion recommending this apartment to anyone. 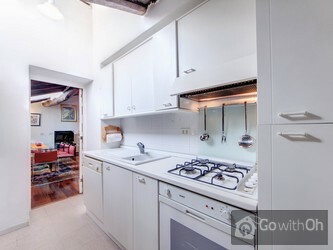 Apartamento muy bonito y amplio con inmejorable situación en pleno centro de Roma. Desde allí puede accederse a pié a todas las atracciones turísticas importantes, y tienes a mano restaurantes de todos los precios, tiendas, supermercados... La atención del anfitrión es inmejorable, y te ...añade un toque de seguridad y ayuda para cualquier cosa que necesites. Nosotros volveremos a este apartamento en nuestra próxima visita a Roma, sin ninguna duda, y por supuesto lo recomendamos como una de las mejores opciones si te gusta alojarte con independencia. 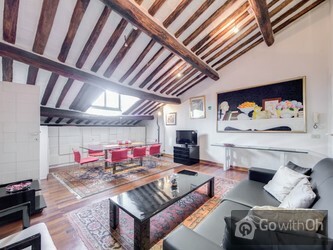 We loved this apartment and the contact R. The location is brilliant, easy walking distance to nearly all attractions. R. is extremely helpful and knowledgeable and really set us up for a good start to our Rome holiday. The apartment is extremely clean and very comfortable. 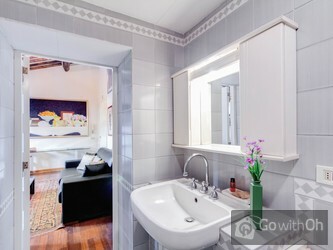 We would definitely ...recommend this apartment and because we threw a coin into the Trevi Fountain, we will be back to stay in Rome and this apartment again someday (soon we hope). Thank you very much for everything. 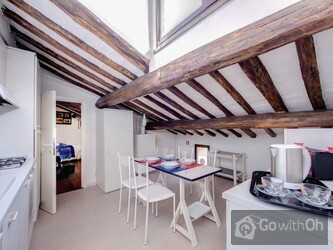 Appartement très bien situé et spacieux.Très bon accueil. Quelques points de finition à rafraîchir (seconde douche fonctionnant mal). The apartment was excellent. Very clean and cosy and beds very comfy. The location was perfect. It is right opposite the Parlimento building with galaria style shopping mall nearby. The tourist busses can be picked up from the nearby square where there is also the local supermarket (the Despar). ...The Trevi fountain, pantheon and Spanish steps are less than 10 min walk. The coloseum around 15 mins and the Vatican around 25 mins walk. So the location is exceptional. The area is well lit at night and literates with police so very safe for when you pop out to the local restaurants for dinner or just an evening stroll. The owners are very friendly and answered all my queries by email, including organising a taxi from the airport. If I could rate the apartment and experience higher I would! No tengo palabras!!! ubicacion excelente y R. excelente!! ha sido una experiéncia de 10 sobre 10. 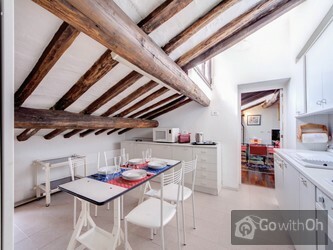 The apartment was centrally located, within walking distance of Piazza Spagna, Piazza navona, the Pantheon, Fontana di trevi, the colosseum and Giolitti (the best gelato parlor in Rome). R responded to my emails in a very timely manner, and even though he did not speak English that much, I had no ...problem understanding him. Everything went smoothly from check-in to check out.The flat is big enough for 6, both bathrooms were in good conditions, with clean towels and showel gels provided. 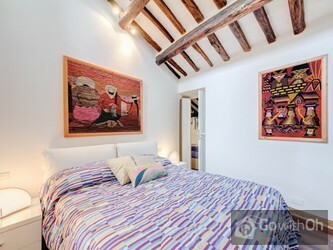 The mattress in the master bedroom is of quality and allow for a good night sleep after a long day of sightseeing. If you do decide to stay at this apartment, I recommend you try one of the restaurants nearby: Obika. They had the best caprese I have ever had. 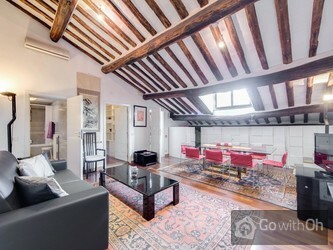 Appartement très bien situé pour faire un maximum de visites à pied avec des enfants de 6 à 10 ans. A la saison où nous étions pas de bruit dans la rue mais ça doit être comme ceci toute l'année car il est en face du parlement et donc beaucoup de policiers.Appartement bien équipé et très... joli.Propriétaire très très sympa mais attention il ne parle pas français pour ceux qui ne sont pas bilingues.Je vous le conseille les yeux fermés. Creo que la ducha del baño de la habitación principal es mejorable. También es mejorable la iluminación de la cocina. Por lo demás todo perfecto y el propietario muy amable. Merci à R. pour son accueil et ses conseils. 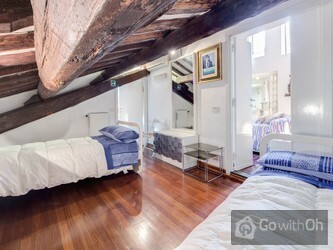 Je conseille fortement cet appartement bien placé et très agréable. Nos encantó el apartamento!!! El propietario majísimo y muy simpático, dispuesto a ayudar en todo lo que necesitáramos. El apartamento tiene todo lo necesario para pasar unos días en Roma. Las camas son cómodas, el piso limpio, precioso y decorado con encanto, y muy amplio! La zona es muy ...buena tanto de día como de noche y puedes desplazarte andando sin problemas para la mayoría de los sitios: la fontana di Trevi y el Panteón están a solo unos minutos. Para dormir no hay ningún problema de ruido pues al ser un ático no se escucha nada :) Sin duda volvería a alojarme aquí si volviera a Roma. 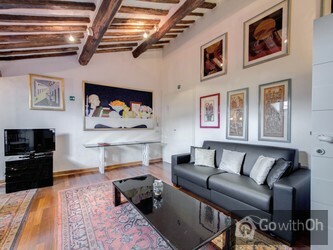 What a fantastic apartment in a great location (Piazza Parlamento). Everything went smoothly and it really was ideal for our family of five. Highly recommend this apartment and hope to return someday. Thank you!! La ubicación es excelente! !,la mejor,puedes llegar a todos lados caminando,y aparte la zona es muy tranquila y segura (enfrente del parlamento),la atención de R impecable,el apartamento está muy lindo y limpio,la única crítica es que le falta presión al agua en la ducha,algo que incomoda a la ...hora de ducharse,pero todo lo demás está muy bien.De volver a Roma,este sería nuestro alojamiento. The location of this apartment was perfect, everything was in a walking time of 15 minutes or less. The owner was extremely welcoming and helpful. Let him organise a taxi too, F. was our driver and he was brilliant.The apartment was clean and very well equipped.Perfect! Sehr freundliche und unterstützende Kontaktperson, tolle Lage, 2. Schlafzimmer sehr klein und niedrig (aufrecht gehen kaum möglich),alles was man braucht im Appartment vorhanden, sauber, Warmwasser in der Dusche nur mit sehr kleinem Strahl verfügbar, Duschen funktioniert nur, wenn kein anderer ...Wasserverbraucher aufgedreht ist.Alles in allem - tolles Appartment! Location is amazing, can walk to most of Rome; apartment had AC, WiFi, Blackout blinds, memory foam master bed, everything you need to be very comfortable. Apartment owner was very helpful in making us feel at home - would recommend this apartment without hesitation. Location and the welcome. We rated the place highly. La ubicacion es perfecta, tanto para ir andando como la convinacion de buses para ir mas lejos, y el aprtamento tiene todo lo basico, esta claro q no es un cinco estrellas pero es perfecto para ir con tus amigos para pasar unas vacaciones a tu aire sin horarios. 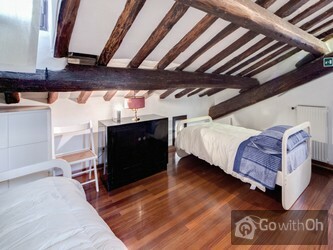 We really liked it, the apartment is cozy, in a brilliant location and the owner was helpful and friendly. We would definitely recommend it. Situación, amplitud, funcional.R excelente.Taxista proporcionado inmejorable. La ubicación es perfecta y la atención por parte del responsable no podría haber sido mejor. Todo perfecto. Comme je l'avais lu l'emplacement est super. L'appartement très agréable et propre. Juste à noter que l'aspect mansardé est très charmant mais du coup les plafonds sont très bas par endroit. Notre évaluation ne tient pas compte du fait que nous avons eu un énorme stress en arrivant sur Rome ...car il y avait une grève des transports plus de métro, plus de bus et les taxis complètement débordés nous avons beaucoup attendu puis marché (difficile et angoissant de nuit dans une ville que nous ne connaissions pas et avec un jeune enfant) avant d'en trouver un. La personne de contact s'est fortement agacé de ne pas nous voir arriver (2H30 plus tard) nous indiquant qu'il n'attendrait pas plus mais s'en est excusé ensuite à notre arrivée et nous a bien accueilli. La ubicacion es excelente ya que puedes acceder a pie a todos los lugares interesantes de Roma, por poner un ejemplo, lo mas lejano era el Vaticano y aun asi fuimos a pie con dos niños en menos de 30 minutos. El propietario es muy amable y el apartamento esta muy bien y muy limpio pero te llevas un... poco de decepcion al compararlo con las fotos (mobiliario viejo). Es un apartamento muy céntrico, con todas las comodidades. La persona de contacto muy agradable, nos ayudó con el taxi, fue perfecto. Una estancia estupenda, lo recomiendo a todos. Die Wohnung war einfach perfekt!Alle Highlights, die wir in den drei Tagen sehen wollten, waren fußläufig zu erreichen, und auch unser Lieblingseisladen, Giolitti, war nur zwei Minuten entfernt. Die Wohnung lag in einer sicheren Nachbarschaft, sie war sauber und gut eingerichtet (es gab sogar ...Adapter in zahlreichen Ausführungen), R. L. war äußerst nett und hilfsbereit und F. R. hat uns mit dem Taxi gut vom Flughafen abgeholt - wir hoffen, noch oft wiederkommen zu können!Einziges Manko: die Fliegengitter vor den Fenstern (auch im Wohnzimmer) sollten erneuert werden. It's very near Via Corso; which is the main street that leads to most of the tourist spots. Everywhere is walkable from the apartment; the farthest was the Vatican which took 30 mins to walk. The apartment was well-equipped and secure (heavy door with a key entry and a doorman in the morning + the ...apartment door almost looks like a bank safe). The only thing lacking was a washing machine. 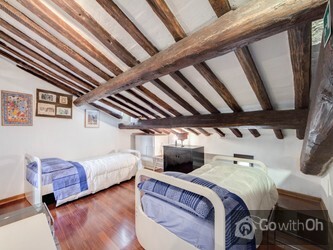 The bedroom with the 2 single beds looks a bit dark and dingy and the ceiling is a bit low. Master bedroom and sofa bed were quite comfortable; as well as both bathrooms. Overall, the apartment is an average-sized one; but obviously you cannot make too much noise so as not to disturb the rest of your flatmates. Had a bit of misunderstanding with the owner upon checkout but was resolved in the end. La estancia con dos niños pequeños, 4 y 7 años fue estupenda, R. explica con detalles el apartamento, limpio, silencioso, bien ubicado y cómodo con niños, cama grande muy cómoda y el tranfer con F. rápido, cómodo y amable, si se contrata el tranfer importante decirle a R. que se viaja ...facturando o no equipaje, pues la puerta de salida del aeropuerto es diferente. Nosotros estuvimos esperando y F también hasta que llamé a Oh Rome y solucionamos el malentendido. Roma vale mucho la pena, es fácil de andar, hicimos TODO andando, la niña llevó silla de paseo. Importante planificar viaje para ahorrar colas en Vaticano, por ejemplo, cogerlas on line. Entradas gratis primer domingo a museos, coliseo etc y el último domingo de mes al Vaticano. Un saludo a R. y a F.
Excellent location in centre of Rome. The owner R was very helpful - organised taxi to and from airport, storage of luggage on last day. We had a problem with one of the toilets which was quickly sorted. The apartment was very spacious, however the kitchen could have been a bit more stocked with ...utensils - no cheese grater ( for parmesan), pot for pasta not big enough, no wine glasses! 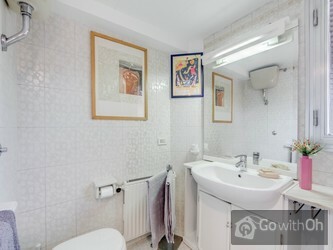 Apart from these minor inconveniences I would recommend this apartment to anyone looking for accommodation in the heart of Rome. R, you are a gem. Have stayed in Rome many times but I have never encountered an owner as obliging and pleasant as R. He arranged the taxi pick-up from the airport and also the same people to transport us to Civitavechia after our stay. He was there to say hello and goodbye, looked after our luggage... and presented us with a spotless apartment. The location is superb. 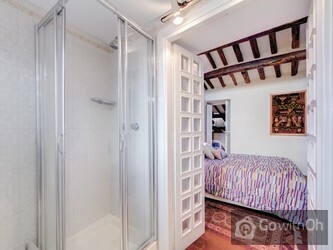 Close walking distance to the Spanish Steps, the Trevi, the Campo and all the other places you would want to visit. Absolutely brilliant. 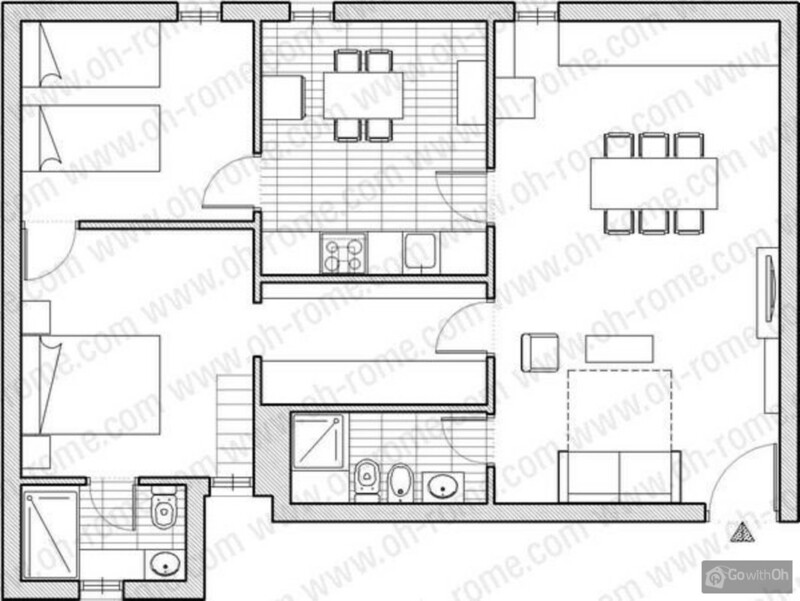 Two very usable bathrooms (one ensuite) and two bedrooms. 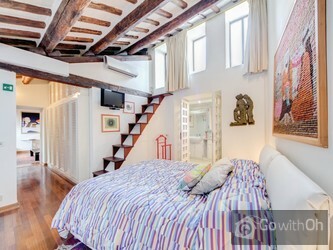 The only negative would be the size of the second bedroom (this is a loft apartment), but very forgivable given all the other great plus's. Ideal for 2 couples, or 1 couple plus kids. Location was fantastic. Apartment was big enough for our family if four. Owner R was very helpful. Le meilleur point fut la localisation géographique. Tout se fait à pied. Points à améliorer: les accessoires de cuisine. Il n'y a pas de bon couteau coupant. Le lave-vaisselle n'était pas fonctionnel, il n'y a pas de spatule, la poignée de la cafetière est brisée. Merci! Cher client, nous vous remercions pour vos commentaires, nous les avons bien pris en compte. Nous vous confirmons que nous nous sommes mis en contact avec le propriétaire qui nous a confirmé avoir contrôlé léquipement de la cuisine, remplacé la cafetière par une nouvelle, et ajouté tous les ustensiles qui pouvaient manquer. De même, il nous a informé que lappartement ne dispose plus de lave-vaisselle, nous regrettons les désagréments et confirmons que nous lavons enlevé de la description. Casa veramente bella e caratteristica, posizione semplicemente favolosa, R, la persona che ci ha accolto, molto disponibile e gentile. Appartement très agréable, on y retournera! The location was absolutely perfect and the apartment is beautiful. 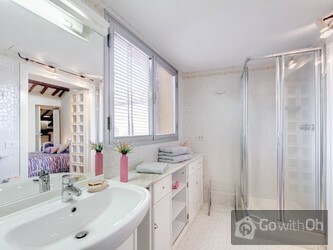 Big common area and big and comfortable bathrooms. The bed for people 5+6 was a couch, which wasn't ideal, but it was alright. 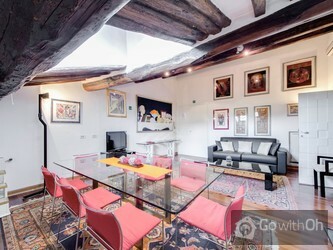 Excellent location - in the heart of everything - within walking distance of the Spanish Steps, The Pantheon, the Trevi Fountain, etc. R was very welcoming and informative. The apartment is comfortable with good air conditioning. It is especially good for a family with children or a couple. Location is great with a range of shops, restaurants and most popular sites within walking distance. R arranged a very good taxi service to/from the airport. Tout s'est bien déroulé quant à l'accueil, la situation géographique. Surprise de voir l'appart. Pas tout à conforme aux photos. Très sombre et quant à la douche ce n'est pas du tout la réalité. Exiguë+++ et besoin d'un mega rafraîchissement.